The important health benefits of elderberries include their ability to alleviate allergies, boost the immune system, protect against bacteria and infection, lower blood sugar, help with weight loss, moderate the digestive process, and slow down the spread of cancer. Elderberries are the fruit of the flowering plant known as Sambucus, more commonly referred to as elder or elderflower. The full scientific name of the most common variant, from which we get the majority of our elderberries, is Sambucus nigra. You will primarily find elderberries in the Northern hemisphere, particularly in Europe and North America, although some southern species are grown in Australia. The berries are black or very dark blue and have a sharp, sweet flavor that makes them highly preferred for desserts, syrups, jams, jellies, spreads, and as the base for various cocktails and beverages. Many people think that they lend this scientific name to Sambuca, but in fact, that is not true. Elderberry wine is very popular and can be made quite simply at home. Since most of the berries in the genus Sambucus are toxic, caution is suggested and cooking the elderberries before consuming is always a wise choice. The branches, leaves, and twigs of all species contain trace elements of cyanide, which can build up in your body and eventually kill you, so be careful! However, despite the implicit risks of elderberries, they are packed with beneficial nutrients, so they have been a part of traditional medicine for hundreds of years, and some of the health benefits have even made it into the mainstream. 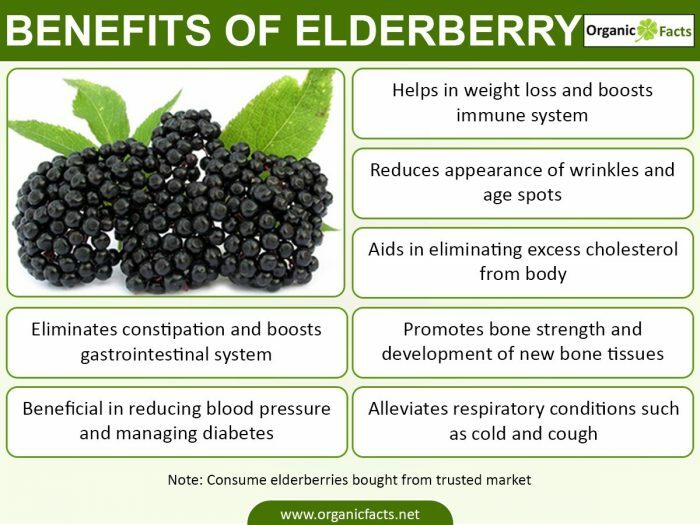 The recent popularity of elderberries can largely be attributed to the discovery of its many health benefits, which are explained below! Elderberries packed with nutrients including minerals like iron, potassium, phosphorous, and copper, as well as vitamins, such as vitamin A, B, and C, as well as proteins and dietary fiber. Add some of the beneficial organic compounds that function as anti-inflammatory and antioxidant agents in the body, and you have one powerful berry! Although most fruits and vegetables can help you hit your fiber goals for the day, few fruits can boast more than 40% of your daily requirements for fiber in a single serving. Elderberries are packed with dietary fiber that can help eliminate constipation, reduce excess gas, and generally increase the health of your gastrointestinal system. Fiber can also help to increase the nutrient uptake efficiency in your gut so you get more out of your food! With the high level of dietary fiber, combined with the metabolism-speeding effects of a solid vitamin and mineral injection, elderberries aid in weight loss. The fiber keeps you feeling full, the low-calorie count doesn’t affect your intake too much, and you also get dozens of other health benefits as well! Considering that so few species are edible, it is always wise to find elderberries in a licensed and reputable store. Don’t pick wild elderberries and it is suggested to cook all berries before eating, as they may contain dangerous traces of cyanide. Furthermore, being allergic to plants in the honeysuckle family is not uncommon, so be careful about being up-to-date on your food allergies before adding elderberries to your diet. Finally, they are known to act as diuretics for some people, so if you are already struggling with kidney problems, then elderberries may exacerbate them.